It would let states keep the ACA insurance programs they have or try other options, she says, hoping millions would avoid losing health coverage after a repeal of the law. Republican Sens. Susan Collins of Maine and Bill Cassidy of Louisiana will introduce a replacement for the Affordable Care Act that would allow states to maintain what they have or choose other options to provide health insurance to their residents. 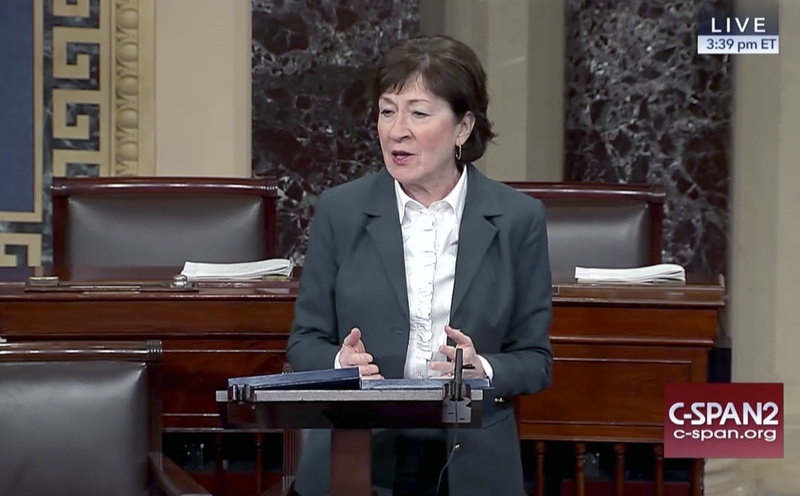 “If (states) like the Affordable Care Act, they can keep the Affordable Care Act,” Collins said on the Senate floor Tuesday afternoon, referring to the new plan as a more “comprehensive and creative” approach. The Affordable Care Act covers more than 20 million Americans, including about 80,000 Mainers. Under the ACA, the uninsured rate nationally has declined from 17.1 percent in 2013 to 10.9 percent in 2016. If Republicans in Congress repeal the ACA without a replacement, it would strip health insurance from millions while reducing taxes for those who earn more than $200,000 per year by eliminating surcharges that helped fund the ACA. Collins spoke immediately after Cassidy, a physician, rolled out the bare framework of a potentially bipartisan replacement plan. Details of the replacement bill were not immediately available because it hasn’t been introduced yet, but the bill, called the Patient Freedom Act of 2017, is expected to be unveiled within a week. Left unanswered Tuesday were many details, such as exactly what other options the states would have besides staying with the ACA, what complications might arise if coverage plans differ from one state to another, and how funding would work, although Collins alluded to maintaining the current funding system. “I’m not saying that it’s perfect, but it’s important that we put specific proposals on the table,” Collins said. Although she voted with Republican leadership to start the ACA repeal process, she has also pushed for more moderate alternatives to strategies proposed by party leaders. Cassidy said one option in the bill would allow states that choose not to participate in the ACA to enroll all their residents in a plan offering only bare-bones, catastrophic health coverage. Adults could opt out of these plans, but Cassidy said he believes most wouldn’t and that it would be a way to include young, healthy people in the insurance pools without imposing an individual mandate. The individual mandate is how the ACA has pushed young, healthy people to sign up for insurance, but Republicans largely oppose it. Collins said states that choose alternatives to the ACA would get the same funding they have received to expand Medicaid or fund individual marketplace coverage. The ACA marketplace is where those who don’t have employer-based insurance – such as self-employed or part-time workers – can purchase insurance. Most receive subsidies that cover much of the cost of premiums for the plans. Democrat Richard Durbin of Illiniois, who spoke after Collins, called the approach “reasonable,” although he said the details of the plan require more scrutiny. Both Cassidy and Collins emphasized that their plan could attract support from Democrats. “This is not a Republican plan or a Democratic plan. This is a patient plan,” Cassidy said. Repealing the ACA would take only a simple majority vote in the Senate, but a replacement plan would require 60 votes and the support of several Democratic senators. The new Senate has 52 Republicans, 46 Democrats and two independents, Maine Sen. Angus King and Vermont Sen. Bernie Sanders. Collins again spoke against a “repeal and delay” strategy recently pushed by Republican leadership that would postpone coming up with a replacement for years. “Now, some of my colleagues have argued for immediate repeal without any replacement, an option that I reject for it risks leaving millions of vulnerable Americans without affordable health insurance and would undo important consumer protections provided by current law,” Collins said. Emily Brostek, executive director of Consumers for Affordable Health Care, an Augusta-based health policy advocacy group, said it’s encouraging to see Collins and others offer replacement plans that might attract Democratic support and potentially avoid an increase in the numbers of uninsured. President-elect Donald Trump said over the weekend that an administration plan is in the works that would provide “insurance for everybody,” but he did not offer any details. “I’m pleased to see a growing consensus among members of both the Senate and the House that we must fix Obamacare and provide reforms at nearly the same time that we repeal the law in order to protect families who rely on the program, and to give insurers time to transition to a new marketplace that is based on more choices for consumers,” Collins said. Other Republicans have put forward plans that would cover far fewer than the more than 20 million who receive coverage under the Affordable Care Act. A report released Tuesday by the Congressional Budget Office said that if the ACA was repealed and a 2015 replacement plan introduced by Republican Sen. Mike Enzi of Wyoming was approved, about 18 million more Americans would lose insurance in the first year and the number would climb to 32 million by 2026.